Having said our ‘au revoirs’ to Alain in Frankfurt, Anne and I arrived eventually, 10 minutes early, at London-Heathrow. As always, plans for the next trip are already in place – north western Argentina in October 2005. Eventually I tumbled into bed at 9 pm BST – 33 hours after getting up at Pichidangui. During our trip we had travelled 21,832 km (some 13,500 miles) to get from England via Frankfurt and Buenos Aires to Santiago and then drove as far north as Maria Elena and back again. In Chile we travelled 5,550 km (c. 3,400 miles) by road – some 2,000 km of which along the often excellent Pan Americana. We had only one puncture. I came back with 5.07 GBytes of extra data (mainly digital images) on my laptop in my Copiapoathon 2004 folder – now containing 3,670 files. In addition, Alain’s folder contains another 2.88 GBytes with 2,185 files. It was the first time that I relied entirely on digital cameras and without regrets. Each evening I downloaded that day’s images from Alain and my cameras to the laptop and, after some little time to flip the portrait format pictures over, we’d open a bottle of wine and enjoy the daily image show, all before dinner. As always, the reports are my way of documenting and reliving some of our adventures before they fade from memory, or rather blend into one, and to fulfil a promise to Anne and Alain that I’d tell them in detail where we had been and what we had seen after the event, rather than in the field, where every one should concentrate on absorbing as many images and experiences as possible without having to know what, where and when. For now, books on north west Argentina are piling up around me and planning for 2005 begins in earnest. 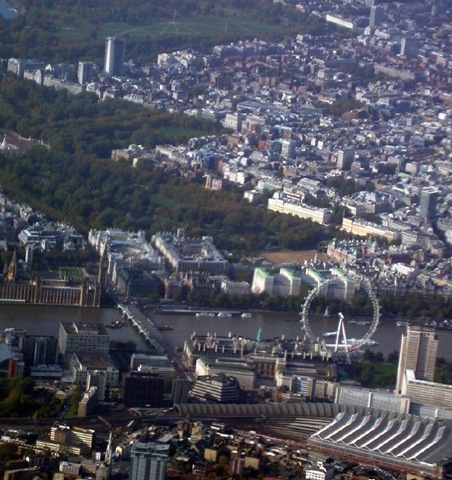 Houses of Parliament, Westminster Bridge, old Town Hall, Millennium Wheel, foreground: Waterloo Station.